Home » Blog » FREE Summer “Real Food” Meal Plan! 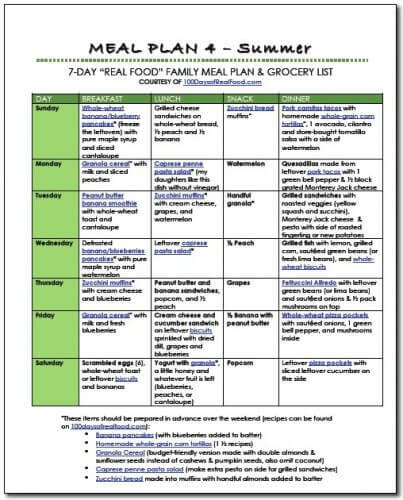 You asked and I listened…here’s yet another free “real food” meal plan! This one utilizes produce that’s typically in-season during the summer months, and since so many of you have your own garden you have yet another cost-saving opportunity when stocking up for this meal plan. Creating these plans is rather labor-intensive though so I can only do it every so often. If you’d love to get some guidance on a more regular basis please check our sponsor, The Fresh 20, who cranks out new and creative meal plans on a weekly basis (including vegetarian and gluten-free options)! Become an email subscriber by entering your email address in the box below. Follow the instructions in the welcome email. Make sure you check your junk/spam folder (or search all mail for 100daysofrealfood) if you don’t see it. Hi Lisa! I’m not on Facebook but would love to see the menu, if I may. Thanks for another meal plan. I’ve been using your recipes since I have found your site. If you’re not on facebook leave a comment, and I will email the meal plan to you! I appreciate you sharing your meal plan. One thing I noticed is that you’re using quite a few bananas. One of the things I’ve started doing this year is trying to cut out using bananas during the summer. There’s so many different fresh fruits available locally that I decided to try and focus on using them in my meals and only use bananas the rest of the year. I still have plenty of frozen bananas from earlier in the year for smoothies and any baking I want to do, but I decided to take this on as a challenge for myself and it’s working really well! One of the reasons I use a lot of bananas is because they are one of the cheapest fruits out there!! They are also a good base as a natural sweetener for smoothies and pancakes. I also incorporated other seasonal fruit into the plan as well including cantaloupe, watermelon, and peaches. Hi Lisa, My family is halfway through our “Summer Vacation Real Food Challenge,” and it has been great! Please e-mail me the new meal plan when you have a chance. Thanks so much! Keep in mind that my meal plans do not take into account sales prices or coupons and the more expensive organic version was used in most cases. There are a lot of opportunities for additional cost savings! Thanks so much for offering these menus. I absolutely love what you are doing here and intend to continue following your blog. Keep it up! Thank you for sharing these! I too am shocked at how much a family of 4 receives if they qualify for food stamps. My family of 3 spends about $500/month buying as much organic produce and grass fed meat as possible. Maybe we should apply for food stamps so I can get even more of the higher priced real food! I’m sure it is very time consuming to make these meal plans but I appreciate it so much! We are very new to “real food” and just came home from vacation yesterday so it is a wonderful treat for me to just “print and shop” this week! Thank you! My son recently had a MRI scan of his head/brain because of SEVERE headaches, even waking him during the middle of the night at times…also suffering from fatigue, dizziness & joint pain to the point of having to limp. Thank the Lord, the MRI came back fine as did the extensive bloodwork but now I’m wondering if it could be a gluten intolerance, maybe even celiac disease? I know your menus aren’t exactly GF but I do know they’re WAY healthier than we’re eating now(though like you said before you started this blog, I feel we eat healthy too, at least compared to most families, yet when we start on the real food plan, I KNOW we’ll realize how un-healthy we really were eating because we’ll no doubt feel so much better…just like y’all did! :) I figure we can tweak your menus to be GF & I pray that my son will be relieved from all of his issues in the near future! I’m done with my book, lol! I’m looking forward to getting the summer plan. THANK YOU, Lisa for doing this for all us!!!! Keep in mind that you’d only get the full amount of food stamps (now SNAP) if you had no other income at all. Otherwise, it’s scaled according to what you make and you’re expected to make up the difference. Many families can’t afford to make up that difference if they’re getting assistance and don’t have much income. Last year, my family of four got $389 a month when we were making $1,600 a month and paying $1000 in rent. We couldn’t have made up the difference between the $389 and the $732 per month of your menu plan, and are able to eat real food within the budget I had of less than $100 a week. I am totally with you on making real food choices, but also suggest doing a menu based on the average amount a family would get on food stamps rather than the maximum amount, or even less than that – a poverty menu, as others have mentioned. For those receiving food stamps, check out your farmer’s market and see if they’ll accept EBT. Some have started to take food stamps, so you have the bonus of supporting local farms and getting locally grown, real food. Go at the end of the market and bargain hunt! I’ve gotten the ends, bruised fruit that’s great for smoothies, a huge box of bruised/not pretty tomatoes that made fabulous sauce, for next to nothing. You inspired me. I have heart disease and though I eat healthier than most, even make most of my own food (right down to breadcrumbs and chicken broth), I still slip. Today is day one of the no junk food challenge. Thank you for paving the way. Your website is my new favorite. It’s good to see the next generation carrying on the message of whole foods. My children are 24 and 28, and I have been reading labels and eating this way since I was a teenager in the 70’s. Looks like menu selections from weight loss diets I’ve been on. I’d venture to guess that most families would have to make consumption modifications to eat this way. Maybe this would be good since a good majority of the US is overweight? When you can’t have gluten or dairy, your choices are even more limited…& more expensive. I just downloaded all 4 meal plans. You have to click on “Meal Plan” several times before the 4 images pop up. Just a cursory glance seems to indicated a menu that is heavy on the grain-carb side, which I am trying to avoid. Also, the prices are estimated from the southeast region of the US – if you live in a region with a higher cost of living as I do, the prices will be much higher. In particular, the prices for organic fruit seemed unrealistically low. In my area, the true cost would probably be double. Also, Meal Plan 4 requires that you own a slow cooker and a tortilla press, neither of which I have or plan to purchase. Not saying these are bad plans, but you must take your personal circumstances and preferences into account when estimating the true cost. You have to “like” the page then click on the image you want to download. Good luck! Thanks for these! I’ve had a hard time finding healthy ways of making my meal plan. I know I’ve spent more then I need to and added more food. My spouse is a full time seminary student and I’m a stay at home mom. We’re looking forward to homeschooling next year and want to simplify life. That includes a healthier menu, and meal time order! Thanks! Not all food stamp recipients receive $167 a week for a family of four. Our budget for a family of 6 is $125 per week. That is part food stamps and part our money. I would challenge you to a mini-pledge to $20.83 per person. Or $83.33 for a family of four. I am not trying to stir up mischief. However, I would love to see a site that offers menus with real food to family with low incomes. This could encourage more low-income families to eat healthy. And for those of us that the kitchen/cooking is their weakness (but try extremely hard to overcome their weakness). I fully agree with you on this! We are only a family of 3, but we only have about $80/week to spend on groceries with link. It’s very trying to afford regular (processed/cheaper) food on this budget, let alone anything organic or healthy. Healthy or organic items where we live are VERY expensive. A carton of organic eggs here costs upwards of $4 and the same with organic milk ($5 for a half gallon)! I have only just started to look at your site and already you are my new best friend, haha. Thanks for ALL this wonderful stuff (especially the grocery lists!!!)!!!! Hello and thank you for all the wonderful information! I love the idea of your weekly meal planning so much. If you buy the paid subscription does it offer lower weekly cost plans? We are a family of 4 with a budget of $280-300 max Monthly for food so Im trying to find a weekly plan/ideas with lower cost. Thank you! Lisa’s meal plan are available at no cost. You just need to become a subscriber. The link to the summer meal plan doesn’t work. It goes to a Facebook page that doesn’t exist. Can it be reposted? Thanks!